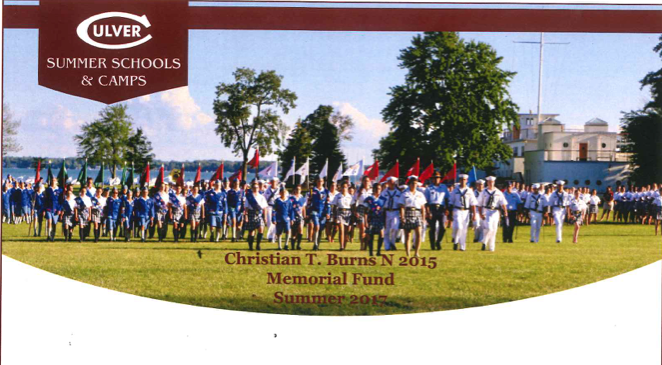 Christian was the third generation of his family to attend the Culver Summer Naval School. His graduation from Culver in the summer of 2015 was one of the happiest days of his life. The friends he made and the experiences he had were life changing for Christian. The Christian T. Burns N 2015 Memorial Fund will provide many future generations of young people the opportunity to thrive like Christian did. Gifts may be made using Culver’s main giving page at: www.culver.org/makeagift. On the giving page under the Designation area choose the drop down arrow and select the option of “Other (place designation in Comments). In the Comments area type in, “Christian T. Burns N 2015 Memorial Fund”, or reference the fund as, “Christian Burns Fund”. To contribute memories, please contact mhburns@purdue.edu.